Can't believe today is the last day of the year. 2015 was indeed the most fulfilling year of my life. We moved into our new home, welcomed Ganpati Bappa home for the first time, my best friend's wedding, my third USA trip and my 5th Wedding Anniversary...all happened this year. I have so many pending posts to do, but instead of fretting over it, I am taking things in my stride and doing things at my pace. For 2016, my goal is a peaceful life, with loads of creative energy and free of negativity and unnecessary competition. I want to travel more, read more, exercise more and eat right. I want to learn a new skill and spend maximum time in the company of my loved ones. And before I start bordering to the nonsensical, let me cut it short and move on to the outfit. I had worn this outfit at the Wella event a few weeks ago. A Black Jumpsuit, combined with a chiffon top, pearl strands and my current favourite; the Dog Bag. Can you believe the first thing that Nimrat Kaur said when she saw me, was how cute my bag was. I was more than happy to accept her compliments. Wish You a Happy New Year! Thanks for all the support and love you have given us for the past year. Last week I received a cute invite from Wella Professionals inviting me to attend the launch of Wella Professionals Elements Range. Having used Wella Products before and since I had recently experienced Wella's Liquid Hair treatment at the JCB Salon, I knew I couldn't afford to miss this launch. The launch was held at the House of Tales Kala Ghoda in Mumbai and was attended by Wella's Innovation Expert Dr.Kerstin Meyer Lipp and Bollywood actress Nimrat Kaur who spoke about her experience about Wella's new Elements range. And how she was impressed with the effect it had on her hair which is constantly treated to styling products round the clock. It was a fun event with good food and company of gorgeous Bloggers. But the highlight of the event was definitely the Newly launched Elements Range from Wella. Dr. Kerstin took us through the entire process by which the Elements Range was developed and how it took them two years to develop this range. It is Wella Professionals first range of haircare products which is free of sulfates, parabens and artificial colourants. This range is inspired by nature and has a specially created fragrance inspired by the green wood’s of the Amazon forest. Dr. Kerstin believes that this range is ideal for Indian women, who have a habit of oiling their hair regularly. To prove that the New Elements Range lathers well on oily hair, Dr Kristen did a small experiment with some water, oil and Wella's new Elements Shampoo and whisked it using a hand blender. Within seconds we saw thick foam lather up in the beaker and we all were very impressed to see that, coming from a product that does not contain any sulfates and parabens. The Elements Range consists of a special ingredient called the Nutree complex which is specially sourced from Germany. The Nutree complex reduces hair damage, enhances the texture of the hair and calms and balances the scalp thereby reducing allergies and sensitivity. I have been using the Elements range since the last week, and I love how it smells while I shampoo my hair. A foresty fragrance that is not too overpowering, but subtle enough to make you smell and feel good. As far as my hair is concerned, the shampoo works wonders while washing my oily hair and the mask has made the ends of my hair shiny and smooth. The mask is something you have to try atleast once. The new Elements Range by Wella is definitely something that will revolutionize the hair care industry in India and abroad as well. Wella's Elements range consists of the Renewing Shampoo, Lightweight Conditioner and Renewing Mask and is available in all leading salons across India such as Jean Claude Biguine, Affinity, Bodycraft, Toni & Guy , Strands, Tresslounge and Headturners. Some more pics from the launch. The weekend trip to Vegas had tired us too much. So we decided to take the weekdays a bit lighter. I am a Piscean and a Self Proclaimed Beach Lover. Nothing makes me happier than walking on the beach. And in California I was in for a treat. You will bump into beaches every few miles, and they just can't get any prettier. Though we couldn't visit all, but we got a sneak peek into many, while we were driving. It was the most surreal experience. We had reserved some of our evenings during the weekdays, for relaxing on the beaches. A relaxed and functional outfit to protect me from the chilly winds on the beach. The Pink Bag was the only fashionable aspect of the outfit. Or so I think..! Hair is the crowning glory of a woman. While some believe that a woman's curves are what make her attractive, I have always believed otherwise. I would always vote for hair as the sexiest feature of a woman. People close to me know, how upset I get, on a bad hair day and how happy and elated I am, on a good hair day. And that is why I have been getting my hair cuts from the same beautician for the past decade. And I have never colored, permed or straightened my hair for the fear of harming them. Because I just can't afford to mess my precious locks. So when I received an invitation from the Jean Claude Biguine Salon & Spa to experience a Cut and Color or Cut and Care, I immediately picked up the cut and care, because coloring my hair is just not an option. But after I confirmed my appointment with the Salon, I developed cold feet. What if they don't understand my hair? What if I don't like my haircut, or even worse, what if they cut my hair short. NOOOOOOOOOOOOOO..! I couldn't bear the thought. After talking to a few of my blogger friends and after saying a short prayer (yup...that's what I always do before I leave for a haircut), I left for the JCB salon in RCity Mall, Ghatkopar. The Salon looked classy and chic....which was a good first impression. The moment I walked in and introduced myself at the reception, I was greeted with a warm smile and they immediately made me comfortable on a chair. 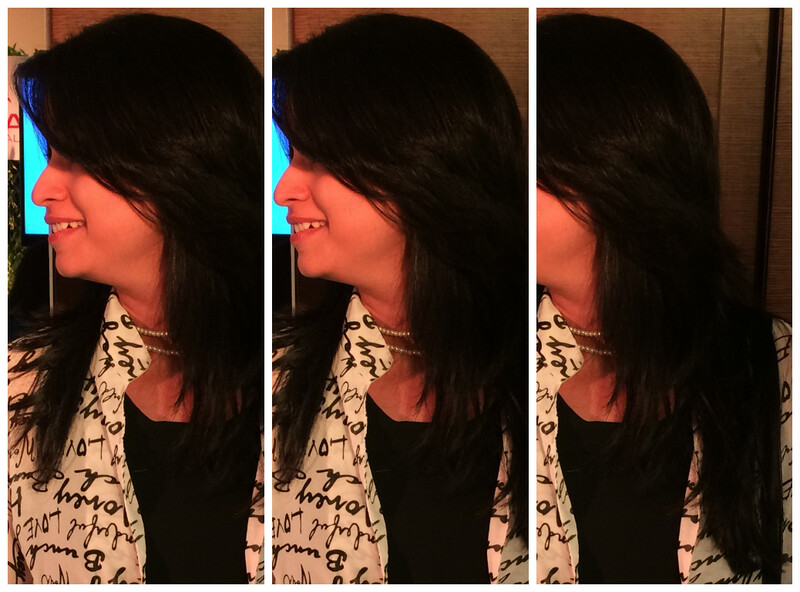 I was then introduced to my hair stylist Chaya Patil. Chayya checked my hair and immediately told me about my dry hair condition. I couldn't agree more with her. She asked me what kind of hair cut I wanted and I gave her a long list of my expectations and requirements. Layers, fringes and DO NOT TOUCH the length of my hair. She patiently listened to me with a smile and took me for a hair wash. She shampooed my hair and instead of a conditioner, applied a Keratin restoration mask to treat my dry hair. Since I have been trying to grow the length of my hair for the past year, they have become dry and fragile on the ends, and hence to repair it, Chaya recommended Wella's Liquid Hair treatment. I had already heard praises about this treatment from my blogger friends and hence asked Chaya to proceed with the same. After my mask was washed, my hair was towel dried. And Chaya started applying the liquid hair solution, to the ends of my hair and rubbed it for better penetration. She then blow dried my hair so that the heat could help the solution penetrate better. The Liquid Hair treatment lasts for upto 3-4 washes and leaves your hair silky and smooth. 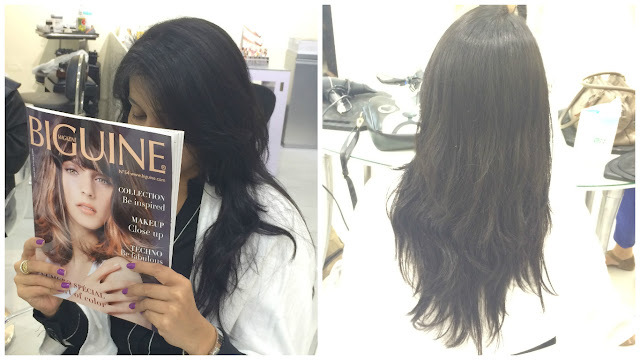 I could feel the difference in my hair texture with just one application. Chaya then took me for a rinse and started my hair cut. Chayya was swift and professional through out the hair cut. She kept talking to me, and confirming, if what she was doing was as per my requirements. After the haircut was done, she blow dried my hair, and voila, I was transformed. And the haircut was Purrfect!!! Just the way I wanted it. The end result was more than what I had expected. Not only did the haircut transform my look, but the liquid hair treatment transformed my hair texture as well. Haircut priced at INR 1900. A little overpriced, but the results were totally bang on. The Professionals at JCB give you what you want and you won't be disappointed. 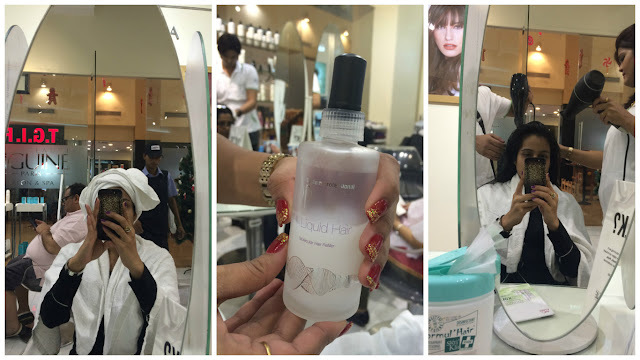 Liquid Hair Treatment priced at INR 1500. Though my hair is naturally smooth and shiny, the fact that I have been trying to grow my hair for the last one year, has made it dry and limp on the ends. 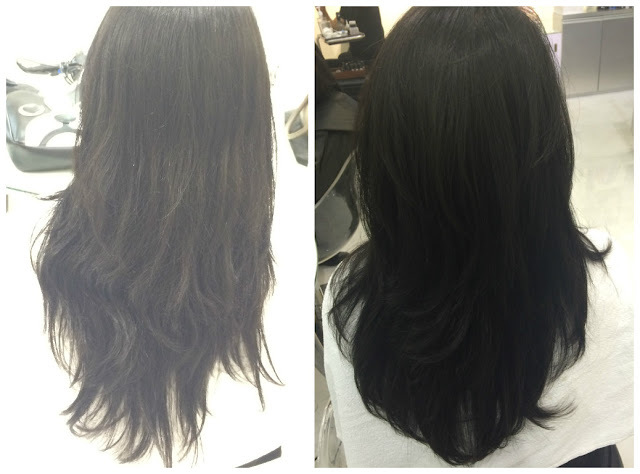 The liquid hair treatment definitely put some life into my hair with just one application. Chaya, my stylist had said that this treatment would last for a couple of washes. I have washed my hair thrice after the treatment, and my hair still feels soft and shiny, even on the ends. The only flip-side about this treatment is that it didn't involve any massage. So I didn't feel pampered, but my hair surely did. Would I recommend this place to my readers: Hell..Yeah!!! Do find the nearest JCB salon and visit it today. P.S. The JCB salon provided the services to me free of cost, but the opinions expressed here are completely unbiased. The return bus journey from Grand Canyon, Arizona back to Las Vegas was a quiet one. I dozed off for most part of the journey. But when the bus passed by the Hoover Dam again on our way back, our bus driver/guide woke us all up to see how beautiful the Hoover Dam looked at night with all the lighting. We continued the rest of the journey quietly, until we reached LAS VEGAS. It was our second and final night in Vegas, and we had very little time left. We quickly changed into our party gear and off we went. This time I chose my footwear wisely. Flat Bellies were my choice for the night. Scroll down to see pictures from our second night at the Sin City. And these are my outfits from the two nights in Las Vegas. This is what I wore inside my huge winter coat as it was really cold on both the nights. Everyone wants to do their bit to help the environment. We are told that this normally revolves around greenhouse gas emissions from factories, cars and industry, and that the best way we can help to curb our carbon imprint is through recycling and using public transport. There are, however, smaller and more subtle ways in which we can reduce our impact on the environment, and this involves all makeup and beauty lovers. Whilst mainstream brands, which use a host of artificial ingredients and preservatives in their produces, seemingly have a monopoly on advertising, there are actually hundreds of beauty products out there that have been sourced sustainably and are 100% natural and organic. These offer the same high-quality finish that we have come to expect from mainstream brands but are significantly better for your skin, thanks to their high concentration of naturally occurring nutrients, and have a much more environmentally friendly in their production and manufacturing. It’s hard to leave behind products we know and love, so we at maryjanefashion.com would like to introduce you to some basic beauty products that we all know and love but that are clean and green to use. Mascara is one of the most popular beauty products around, with many returning to their favourite brands time and again to find the perfect formula to lend volume and drama to their lashes. Many mainstream mascara brands contain silicones and artificial colourants which can be extremely irritating to your skin: considering how close mascara comes to your eyes, some of the most precious organs in your body, we need to be sure to take care of them properly. Living Nature is an innovative cosmetics company combining the best technology and scientific know-how with nature to create products that are high performing and beneficial to your skin and the environment. 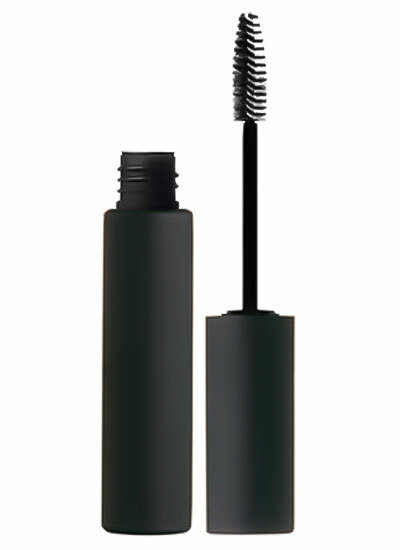 This 100% natural mascara contains natural extracts such as Halloysite clay, Manuka honey and jojoba to create a bold and smooth mascara, which not only produces bold eye looks but also nourish and protect your lashes. Another beauty staple and go-to no matter the weather or occasion is lip gloss. Not only does lip gloss add a charming pop of colour to any ensemble you’re wearing, whether it’s night or day, it can also help to moisturise your lips, some of the most sensitive areas of skin on your body. 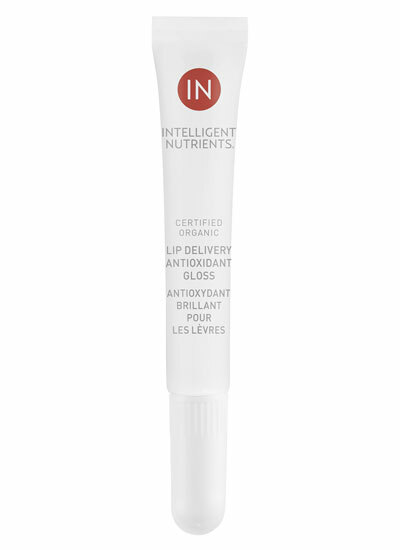 We love this gloss from Intelligent Nutrients, which is certified organic by USDA and uses ingredients that promote sustainability, fair trade and are ecologically sound. This active antioxidant lip gloss is full of complex oils and extracts that nourish your lips, including coconut oil, shea butter, vanilla, cocoa butter, cranberry and red grape. The flavours are natural, the colours are natural and you can be sure that nothing artificial or physically aggravating is coming into contact with your lips and drying them out, as is the case with many leading mainstream brands. The handy plastic container will slip straight into your handbag, and will become indispensable to your beauty routine. Nail varnish is a classic makeup item that many of us have stacks and stacks of. It can provide a perfect complement or contrast for your ensemble, giving you a lift in cold wintry months or a pared back finish if the rest of your ensemble is loud and proud. Many, however, contain a host of chemical nasties in the form of formaldehyde, carmine and artificial colourants that can wreck your nails whilst also damaging the environment in production. Luckily, there are brands like Intensae that can provide natural and safe-to-use nail varnishes that are also fashion focused, offering colours and hues that are on-trend for each season. 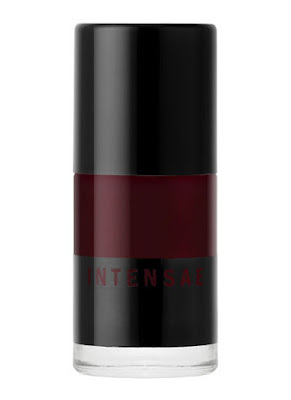 Ethical and innovative, Intensae’s nail varnishes are vegan and environmentally minded as well as high performance. We love this rich red shade in Intensae’s sophisticated bottle: it will look great paired with a cream turtleneck jumper, a fit and flair skirt, opaque tights and loafers.